Combine dried fruits, butter, sugar, honey, orange juice and baking soda in a large saucepan. Stir over low heat until the sugar has dissolved. Bring the mixture to boil and simmer for about 5 minutes over low heat. Stir consistently. Remove the saucepan and leave to cool. Combine the eggs and gently beat it using a fork. Gently stir it into the cooled cake mixture. Fold in the sifted ingredients. Spread evenly into prepared pan and bake for about 1 hour or until cooked. Moist Christmas Fruit Cake – super flavorful fruit cake recipe that is moist and sure to please this holiday season, get the recipe below! Want a moist fruit cake recipe? Check out this moist Christmas fruit cake recipe as the method calls for boiling the ingredients first before baking. A new method to try that guarantees a flavorful fruit cake that is sure to please, recipe by Siew Loon Ho. It’s the time of year again…Christmas!!! It is a season where you can feel so much love in the air and the melodious Christmas tunes never fail to make me happy. It is also a season of eating and drinking! Besides the Roast Turkey, having a really good fruit cake is also a must on my Christmas menu. This year I have managed to bake the fruit cake earlier then usual as I am preparing to pass them as gifts to my close friends. This is a must-try recipe from Catherine Lau which uses the boiling method. I have used this recipes for wedding cakes and Christmas baking and it has never failed to impress my friends and family. The big grin on their face is the best Christmas gift for me. Fruit cake is a traditional British Christmas cake that is full of fruits and nuts and laced with alcohol, usually brandy. This gives the fruit cake a subtle brandy flavor and a moist texture, plus it also allows the fruit cake to be stored fora long time. I always enjoy eating it with a glass of red wine or even a cup of espresso. 7 cups chopped mixed fruits (assortment of raisins, sultanas, currants, dried cranberries, dried apricots, mixed peel, glazed cherries, etc.) 1 cup of nuts (almonds, hazelnuts, pecans or pistachio) 1 -1.5 cups brandy or rum Pour the brandy or rum into the chopped mixed fruits and nuts. Keep it in an airtight container for 2-3 weeks before use. 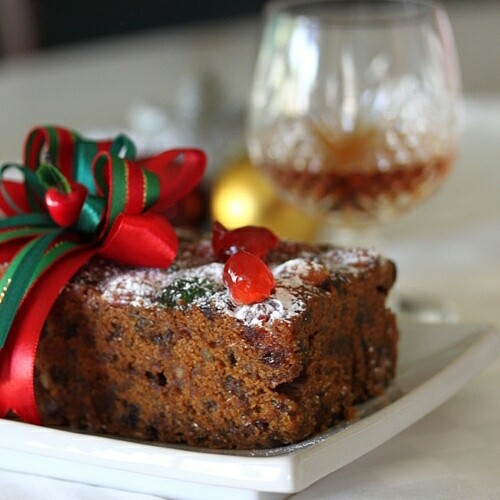 I love fruit cake with Brandy!! Thanks for sharing!! Do you know how to make mince pies (made with rich all-butter pastry and filled with a delicious fruity mincemeat)? I used to purchase from Mark’s and Spencer in Sg. But, US is not selling. Fruit cakes have such a bad name but this looks fantastic! Hello! what are mixed spices? You can get it from the spice section in the grocery store. wow, I like this fruit cake, definitely I will bake this one for Christmas, I used to but a lot when I was in Singapore, Tempations Pastry Shop make a good fruit cake also. Do you a Chocolate Mousse Cake “ETOILE” w/c Tempations Pastry has? Beautiful cake! Thanks for sharing the recipe! Thanks 4 recipe, I live in Australia so can u please let me know how many grams is 2 sticks of butter? Is it possible to use 250 gm of butter? I’ve never heard of a moist fruit cake :) I’m not a big fan of Xmas cakes because it’s always so dry but ‘m definitely gonna try this recipe! I love fruitcake,and have tried many recipes, but yours will solve my problem of keeping the cake moist. Thanks for sharing. I must try this one. Happy Holidays, Bee! I love this cake. My aunt used to bring us this cake during Christmas. Do you recommend any kind of rum or brandy? I don’t know much about alcohol as I seldom used them when I baked. ANy brand of liquor is fine. what can you do to keep the cake moist, if you don’t have any liquor at all to use in it ? Wow! Your fruitcake looks delicious! May I know what sized baking pan do you use? The Baking pan I use is 5 inches by 2 inches. COULD WE ALSO USE A BUNDT PAN FOR THIS? LOOKS AWESOME!! I WILL USE KAHLUA! YUmmmm!! MERRY CHRISTMAS!! I am not a fruit cake person as I always find them very sweet. But I do love reading your recipes as you also share the tips and purpose of adding a certain ingredients into the recipe. That makes us a wiser cook than just put this and that ingredients without better understanding! I love your blog! Do keep the recipes coming. Thanks! Wishing you and family a Merry Christmas and a Happy New Year! use all the 7cup mixed fruits + 1 cup mixed nuts = 8 cups for this recipe? Your recipes look great my problem is they are not printer frinedly. I printed the recipe and got everything comments I got 5 pages printed for a single recipe? next time you want to print JUST THE RECIPE, highlight the recipe, when it’s all highlighted, then go to top of page, click file, (if you don’t see it, right click and click print) when your printer properties come up, you should have an option for printing SELECTION click on that.then, click print. LOL..I actually like fruitcake. It gets such a bad rap. Wish I had some now. thanx for sharing the recipe with us. what can i substitute [email protected] with as i am making some for my muslim friends. Can I replace brown sugar with molasses? Molasses is liquidy but brown sugar is dry, not sure what the end result would be. I made this fruit cake, followed your recipe but it did not turn out dark, more on the light side. What did I do wrong? Thanks in advance. Hi bgawat, it could be due to the brown sugar that you use (some are light brown, some dark brown)or the proportion of dark coloured fruits in your fruits mixed. As long as the taste is good, the colour is unimportant. don’t have dry milk. can i use regular milk or dry creamer? only ask for 2 tbs. Hi I made this cake last night and had it this morning. It’s tastes delicious and moist but has come out dense( not fluffy and airy). Is this cake supposed to be dense? Our have I don’t something wrong? Yes fruit cake is supposed to be densed. Like the pictures. My Gran used to use golden syrup – Lyle’s was the brand – Molasses has a semi-bitter taste, while golden syrup is light tasting, sweet and has the same texture as molasses. Some people use honey. hi bee! just would like to ask what could i substitute for milk powder? and lastly, the brandy where the fruits/nuts were soaked, do i throw that away or mix it with the rest of the ingredients? Hi leng, this is the 1st time I came across a fruits cake recipe that uses milk powder. You can skip it. The residue brandy mix in, don’t throw. Brandy makes the cake tastier, more moist & keeps longer. I am trying this recipe for the 1st time. I have the dried fruits and nuts soaking in the brandy in a pyrex container; do I need to keep the mixture in the fridge since it is almost summer in Australia and it is rather warm? How soon can the cake be removed from the loaf tin? Should the cake be brushed with brandy after it has cooled or should it done when it is still hot? Hi, I’ve bookmarked this recipe for a few months and intend to save it for this year’s Christmas. The raisins are already soaking! I read somewhere that I need to place a pan of water in the oven to prevent cake drying out, do I need to do this in your recipe? I’m so excited!! Hi I’m gonna try this fruit cake. Would you mind to advise how many gram of butter? How much butter of 2 sticks? Hi, thanks for the great recipe. I wonder what causes my cake to look more like a pudding than a cake. Have I used too much orange juice. Please help as I followed the recipe and the batter is very liquid. Thanks once again. Thanks for a great recipe! I made this last week n it is a success n I m hoarding a big chunk of it for myself. Hehe. Hence will make a 2nd one for Christmas Day itself. I wish I hv a longer time to mature n soak the fruits but I m too greedy to gv up my personal stash! Thanks again. Btw I made it w rum. It sounds as though you wrap the cake right out of the oven. Is this so, or do I let it cool as I would any other cake? My first fruit cake… wish me luck. Looks great so far; putting it in oven now! Hi, is it possible to have the recipe in metrics, please? Thx. i tried the recipes… its awesome…superb…i f been receiving repeating orders. thanx. wat can i subtitute the alcohol..if i wan non alcohol fruit cake..
What do you mean by mixed spices.What should I be looking for in the market. Hi… I can see that you are using stick to your butter measurement. How many gram of 1 stick of butter that you are using? Normal block of butter is about 250 gram. You are using here 8 cups of dried fruits and 21/3 cups of all purpose flour .Could you please give the measure ment in grams for both. Can I use cake flour or plain flour in the place of all purpose flour? Plain flour is fine. Not sure about grams. Hello! How long can I keep this cake? I wonder when can I start preparing it for christmas. Thank you ! What if I don’t have dry milk. Will it affect the outcome? It will not taste as great. I’m planning on making the moist fruitcake.But am wondering on time for regular size loaf pan. Tried this cake and allowed all my relatives to try it. They’re now HOOKED! Have been asked to bake a whole cake for each of them next time around. Also, my brother who hates fruit cakes finished half the cake moments after it was out of the oven! Thank you so much for the great recipe! That’s great. This is a great recipe by my contributor Siew Loon. Hi..according to your info-we need least 5-6mini pan loaf,can i use the 9×5 pan loaf instead?? if yes..do i still need to follow exactly 7cups of fruits and 1cup of rum?? Please advise. Thank you so much. Please help me to understand why the baking soda would get heated…I never heard of that and can’t find any info on it. Thank you! Also, I am very happy to be making this cake; It will be my very first fruit cake! 2 sticks of butter meaning how many grams?? I don’t have brandy but can I use bacardi white rum or hennessy ( cognac)? Will this alter the taste too much? What temperature do you store the soaked chopped nuts ? In the fridge ? Mix Fruit cake is my husband favourite. He told me mix fruit cake should be dense and moist.I tried a recipe from other chef, It’s fluffy so I wonder if it is because of the flour I use (Medium Protein Flour). Now I found your recipe and feeling so excited for it. Thanks again for sharing. I followed the exact recipe, but the cake looks wet but it tastes amazing. It doesnt look like the picture you posted, mine doesnt look like cake. What did i do wrong? Hi, your recipe is very interesting and I am gonna try it out. I just have a few questions. 1) the recipe requires me to boil the soaked ingredients with butter,sugar, orange juice, honey and baking soda. Do I need to drain out the soaked mixture before putting in the saucepan or just include it with the rum as well? 2) is it okay to boil the baking soda? 3) the egg has to be mixed with the mixture from the saucepan or the dry ingredients? 4) I noticed it is stated that we have to fold in the mixture. Does that mean we don’t have to use the electric mixer at all for this recipe? I just made this cake the past weekend and it smells so incredible that I can’t stop thinking about it. It kills me to have to wait for days before I can eat it! I made it into 4 Loaves and am planning to give 3 Away. How long do these cakes keep? I’ve read that fruit cakes taste better with age, but there isn’t any indication on how long your fruit cake can keep for. It will keep well for one week or so. I tried this recipe. It tastes good but i don’t get a cake consistency. mine turns out too dense and more of a firm pudding. What went wrong?Even the mixture before baking is runny. Aruna the exact same thing happened to my cake too! Did you figure out why? I made this 2 days ago, as its name, it was very moist and flavorful. The only thing i changed was replaced the 1 Cup orange juice with milk and hence replaced the 2 Tbs milk powder with plain flour. That’s because i ran out of orange juice. Love this cake! thanks for sharing. Hello! My name is Coty de Guerra, I’m from Nicaragua. I made The Christmas fruit cake, it was absolutely delicious!. Can this cake be stored in the freezer ? For how long? Yes you can, for a week? RaRasa, I think fruitcake would keep for months in the freezer…probably up to a year..all that alcohol helps keep it from going bad. .. thought maybe you misread coty’s ques as storing in fridge not freezer. Ps. Going to make for dh for xmas. But I have to shave off a couple days..I only have 10 to soak..
My cake turn out to be very moist like a pudding or kueh, unlike that one in your pic, bits of cake crumbs are still visible. What have I done wrong? I follow your instructions step by step. I make Fruitcake with my mother’s Scottish recepie. She never added 7 cups of fruit. That is way too much. Two cups of fruit is fine. Two cups of raisins either blonde or black. Pitted prunes and crushed walnuts, Sometimes she added a few chopped figs..but that was a luxury. A teaspoon of each: mace, allspice, ground nutmeg, cinnamon. Don’t forget the baking powder, 1 tsp. Molasses 1/4 cup. Orange juice, rum, sherry (Oporto) whiskey if you have it…if not don’t matter. 3 eggs but I’m gonna try with 4….My sister claims that a pyrex with water on the bottom shelf will keep the cakes moist (if you have a problem with the cakes coming up dry or flaky) My mom lined her tins with brown paper (manila) and brushed them with butter. The paper gives the cakes a rich special flavour. A tip so the fruit doesn’t sink to the bottom of the pan, dust it with flour before adding it to the liquid mix. Most important make sure the cake is cold when you slice it and make sure the knife you use is super sharp. Warm custard is a nice topping…and a cuppa! Happy Xmas! Just follow the instructions of the recipe. Hi how much of fruits n nuts need to use for this recipe? ? Please check the recipe, it’s at the bottom, please scroll down.